So I have been absent. Yes I admit it. School has been occupying most of my time and the smoker has suffered from my absence. We have our annual Thanksgiving festival coming shortly and the food and grilling experience will more than make up for my lack of verbosity over the past few weeks. BUT! I had an interesting email from Tailgater Monthly and it seems that my Bacon Wrapped Chicken Thighs with a Mango Scotch Bonnet hot sauce caught their eye. So here it is again, this time complete with recipe. Place all the marinade ingredients into the ziplock bag and place the thighs in them. After closing the bags, massage the marinade into the thighs and place in fridge for at least 4 hours. Prepare your fire. 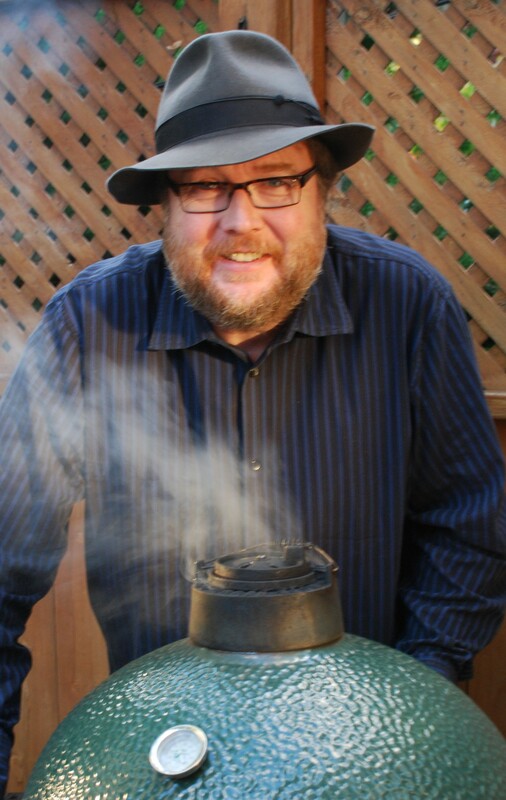 Gas or charcoal, (I’m a purest and use hardwood with the hickory in my Big Green Egg). Lay out the tin foil to prep your smoke pack with 1 part dry and 1 part wet wood chips. Seal up the wood chips in the foil and pierce with forks to make holes in the foil. Big enough for the smoke to come out but small enough to keep the wood in. Remember, more holes, more smoke. When the BBQ is ready, (approx.. 350) place the smoke packs on the coals (or element) and wait for the smoke to start. Take the thighs out of the marinade and pat dry with paper towels. Wet meat will steam the chicken. You want to get it as dry as you can. Wrap each thigh with a strip of bacon and secure it with a toothpick. Give the thighs enough time to come to room temperature before introducing them to the grill. Smoke should be flowing by now. Place a slice of onion on the grill for each thigh and place a thigh on each onion slice. Close the lid and let the fire do its job. Remember, if you’re looking, you’re not cooking, but check for flare up occasionally. 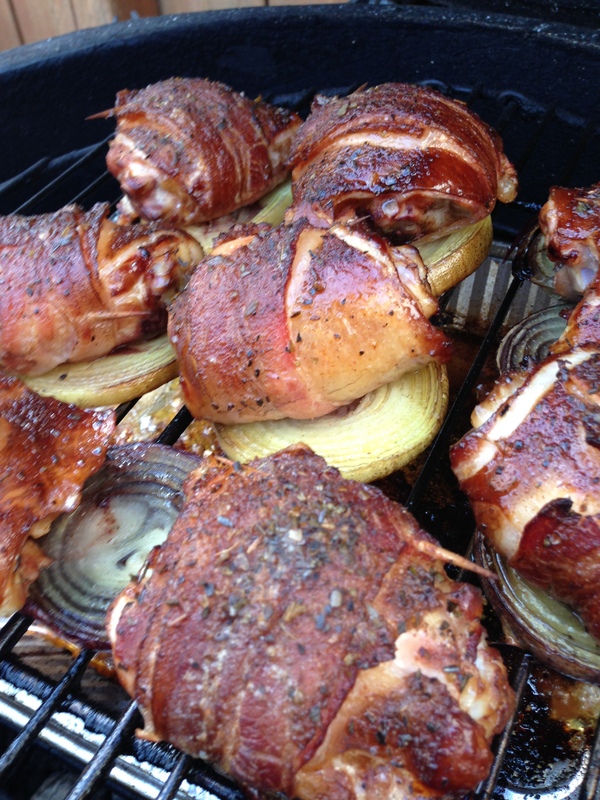 The onion will add flavor but also absorb some of the grease from the chicken and bacon. In 45 minutes (maybe an hour) the chicken should be ready. Carefully wash the scotch bonnet pepper and remove the stalks. Wear gloves and keep your hands away from your eyes! Peel the mango and remove seed. Smoke the chillies on your grill or smoker until they are softened. The longer the smokier, but 10 minutes should do. Place into blender with all other ingredients and blend well. If the sauce looks a little too thick for you, cut it with a little more white wine vinegar. Remember you can add but you can’t take away so just a little at a time until it’s right for you. After blending move the sauce to a small saucepan. Bring to boil and simmer gently for about 10 minutes. Let cool and serve. The finished sauce should keep for a couple of weeks if stored in a sealed and sterilized jar.